AGPtek has several MP3 audio players within Amazon’s bestselling. I decided to review this particular model, however, there are other similar options. One has Bluetooth support, (the AO1T) which I didn’t feel that I needed for my kids. If you’ve never read anything from us before, we try to buy the products we review in order to avoid bias and clarify products that are popular but not regularly reviewed. Usually, we purchase several items in a category and then review them. 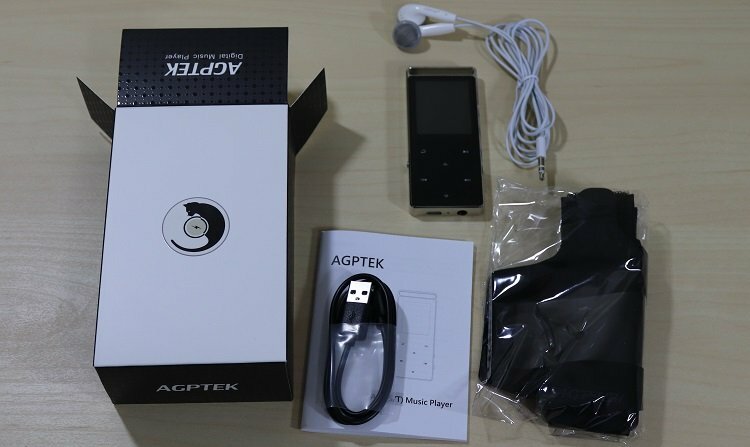 The AGPTek A01 is one of 5 MP3 players we reviewed as options for kids. Earbuds, Instruction Manual, Armband, and USB Charging Cable. First of all, I wouldn’t want to run with this. It’s a bit heavy. Almost unnecessarily heavy. I’m not sure why this design is readily used. Perhaps some may like the extra weight. However, to me it just felt clunky. Speaking of clunky, the menu is the definition of clunky. It’s pixelated and very dated. 9 options are given which is almost more than you need here. Navigating is fairly simple using the skip and up and down volume buttons. The touch buttons are a bit sensitive. So having a lock button to keep a kid playing music on shuffle or keep the music from switching while you’re running or out and about is a nice feature. It took me about 2 minutes to transfer 75 MP3 Files totaling around 550MB. The MP3 player shut down after about 50 of these songs and I had to open the menu back up again to keep installing more songs. If you’re planning to dump 1,000 songs onto this MP3 player, you may find that a bit annoying. However, for me, I’m not planning on putting that much music on here. It’s for my kids after all. So, since I have to make sure the songs are kid-appropriate, I usually limit the library. This MP3 / MP4 player supports video. The 1.8” Display is pixelated and distorted. So, watching anything here was very difficult. Still, it’s likely you won’t be using this device for video. The earbuds for most of these less expensive models are useless. The shape of them is large and difficult for me, someone who’s 6’4”, to keep in my ear. You can see in the unboxing picture above what I’m talking about. The lack of any soft padding hurts as well and the sound is ok. I used my own pair of earbuds for this MP3 player as well as other models tested. The audio was more than satisfactory. In fact, that’s probably the best thing I can say about this MP3 player. It sounded good. The volume went up as high as I like it and there were no support issues for any of the formats I tried. The AGPtek has a few other features that were fine, although again, somewhat unnecessary. It has a pedometer which worked fairly well and a microphone for recording. If there’s one feature I wanted for this MP3 player it was the radio. This was fine while I was outside but didn’t work that well indoors. The prominent stations in my area had static. For me, this is something I personally can’t stand. The armband for this model couldn’t go past my forearms. Other models in this price range had options that could fit completely over my arm. For a kid, it should work just fine. The model I purchased didn’t support Bluetooth. AGPTek has other models that do. However, from what I’ve read the support here is fairly unreliable. So, be aware of this before buying it specifically for this feature. Charging for me was quick and easy. The playback time is listed as 45 hours. I didn’t listen to it that long; however, it didn’t run out as long as I was reviewing these MP3 players. Overall I feel there are better MP3 Players in the $25 to $35 space. This one felt pretty clunky. The menu was bad and it even though the weight is there, I didn’t feel like it added to the overall quality. The one positive takeaway for this model is that music sounds very good on it.